L & L Kilns Doll-Baby Series Ceramic Test Kilns are great little kilns that pack a big punch. Assembly: One 9” high section sits on a bottom. 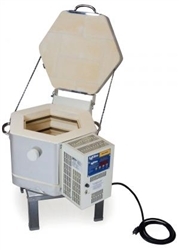 The cone art kiln for sale is very easy to assemble and disassemble. Construction: Stainless steel wrapped around shaped firebrick. There are three adjustable clamps welded to each casing. All assembly is with stainless steel screws. The ceramic test kiln sections sit on a separate stand.